Minority Report's PreCrime division may be a science fiction concept in the sense that it relies on three characters with genetic mutations that allow them to magically see the future, but the idea of arresting people for something they intend to do but have not yet done feels less and less like a futuristic concept. Since 9/11 (an event which occurred during the post-production for Minority Report), the US government has become increasingly concerned with finding invisible enemies before they strike, and the information on the NSA's data gathering practices leaked by Edward Snowden seems like just another in a long line of efforts (beginning with the Patriot Act) to legalize exactly the problematic judicial system we see in this film. While we might not be putting people in a creepy future space prisons based on the predictions of genetically mutated science fiction humans, we are being confronted every day with the same moral and metaphysical questions posed by Spielberg's film. Can our present behavior offer evidence of future crimes? And even if it can, should we be held responsible for things we haven't done? George Orwell may have popularized the idea of an omnipresent government constantly watching over its citizens, but here we find a slight twist on the concept. Minority Report is littered with watchful eyes (the notable exception being the drug dealer with no eyes at all); but these eyes are not the paranoid projections of citizens concerned that their privacy is being infringed. These are not Big Brother's eyes, they're our own, and they're not trained on the populace but rather on the future. The Precogs look at events yet to unfold; John Anderton looks into their recorded visions of them—these are our heroes, not the villains, and their gaze into the unknown is intended to help. But this supposedly benevolent gaze which sees trouble in the future is precisely the one which imprisons us further (just as the NSA doubtlessly believes it is doing the right thing while conducting its attacks on the private sphere). Evil resides in the very gaze which perceives Evil all around itself. In order to avoid crime in the future, we create a criminal present. We constantly look forward, but like the man on the billboard with his eyes shrouded by sunglasses, our vision is distorted by our subjective (historical, ideological) perspective and we see only the evil we want to see. Along with the motif of the watchful eye, the visual style in Minority Report tells us even more about this future world. The contrast between lights and shadows is amped up to give everything a neo-noir aesthetic, but rather than feeling stale they put a spin on the formula by burning out all the light and overexposing the images to give it a hint of techno-futurism (it also helps hide the special effects, which still look good today with the exception of Crazy Greenhoouse Lady's plants). It's no Blade Runner, but it does look unique even if some of the monochromatic color palettes get boring after a little while (and it was probably safer than getting your entire cast and crew sick from inhaling too much fog). 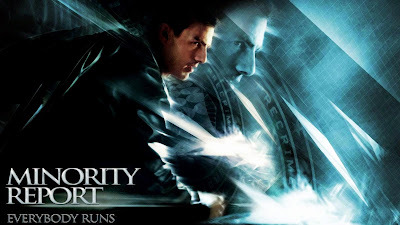 Minority Report was one of the first films to have an entirely digital production design, and the result speaks strongly for the potential of the new medium (even if it speaks just as strongly of its weaknesses). Unfortunately, while these themes and motifs are the most compelling aspects of the film, rather than focusing on them the film jumps around between a variety of less interesting stories. The primary narrative of the hunt for Anderton and his search for his "minority report" branches off into two separate investigations (for his son and for Ann Lively) with an abundance of exposition-heavy subplots on the side (Colin Farrell's introduction & morality explanation, the Crazy Greenhouse Lady's lengthy back-story, the discovery of Anderton's drug habit)—not to mention the tonally inconsistent slapstick comedy. Spielberg has an incredible knowledge of cinematic language, so even at almost two and a half hours the film never really feels long, but parts of it begin to feel pointless when you realize things like the fact that after Anderton gets his eyes swapped out he needs his original eyes more often than the replacements (the only time he needs the replacements is to go shopping at The Gap). We're so worried that the little spiders are going to find him, but then there's no repercussions for them scanning his new eyes. And as others have pointed out, if anyone was going to have an alert out for him it should have been the police department where he used to work. Oh well, just keep moving, I'm sure something else will have consequences later. 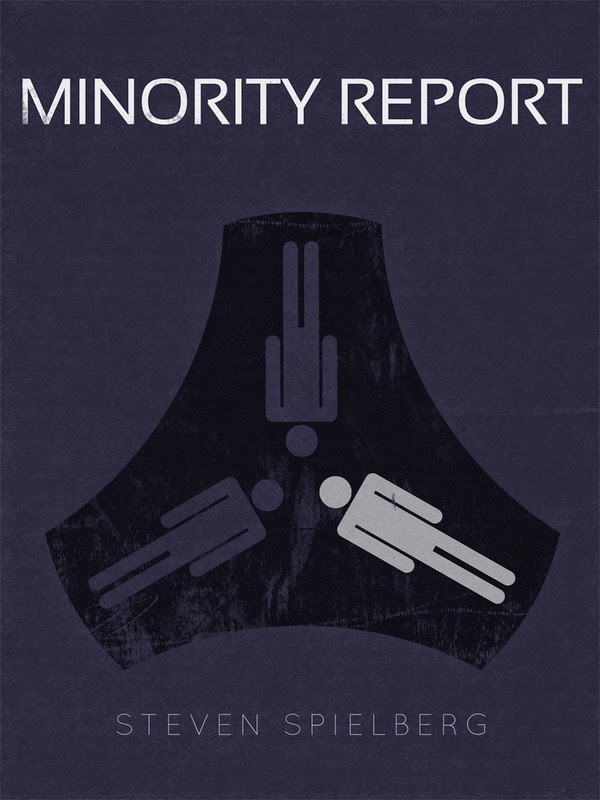 I absolutely loved Minority Report when it first came out, but this rewatch didn't bode as well for the film as I had hoped. 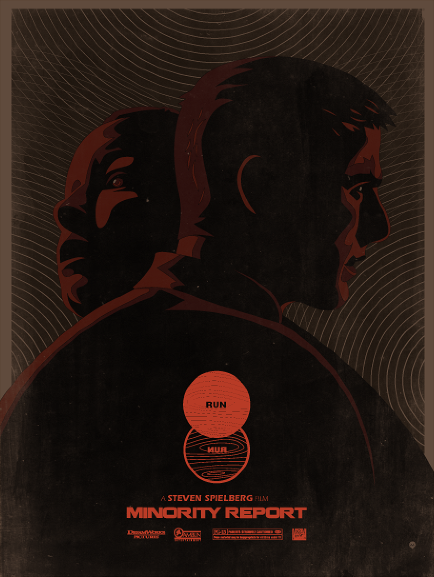 But while it didn't turn out to be quite the exceptional sci-fi thriller I remembered it being, I still really enjoy it both for its increasingly relevant thematic concepts and for its unique visual design. Not Spielberg as his best, but still better than many others.